Here at RockMyRun, we’ve initiated a series of blog posts featuring our awesome Run Rocker family. Each post will be rapid-fire questions that not only showcases the RockMyRun spirit but also presents unique perspectives on the sport of running, how music plays a role, and hopefully offers some tips on challenges you may experience in your journeys. For the second in our series of runner interviews from our inspirational RockMyRun family, we are proud to introduce Run Rocker, Misty Phillips. This time, we did it half marathon style, with 13(.1) questions for Misty who offered some fantastic advice, ranging from improving marathon time to juggling running with family life. I started running when I was about ten years old. I competed in cross country a couple of years in high school. I also ran sporadically over the years and competed in local 5K races and a few 10K races here and there. I really got away from the sport in my twenties when my children were small. 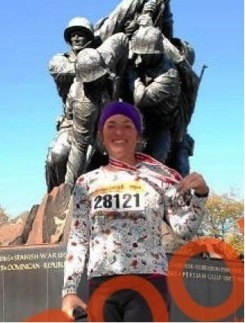 I became a serious runner in May, 2011, when I signed up for my first marathon. 2. How often do you run weekly/monthly? My current training plan consists of 5-6 runs in a 7 day time period. 3. In which conditions you prefer to run (time in the day, indoors/outdoors…)? I love to run on the road. All weather conditions are OK with me – except heavy rain. Although I am not a morning person, I am growing to love early morning runs. There’s less traffic and much more to observe in nature – I like to watch deer, birds and squirrels. 4. What running accomplishment are you most proud of? Or what is your best running experience? I signed up to run my first marathon about two years ago. My goal for that race was finishing. However, the experience left such an impression that I wanted to go back to the drawing board, get a solid training plan together and really see what I was made of. I was afforded the opportunity to work with a wonderful “Koach” who provided me with a plan and weekly feedback. Incidentally, he provides running tips via twitter @Marathon Koach to over 9,000 followers! With his help and my dedication to that goal – I have improved my marathon time from 5:06 (October 2011 – Marine Corps Marathon) to 4:17 (October 2012 – Chicago Marathon) and six weeks later I was able to run 4:07 (December 2012-St. Jude Marathon). 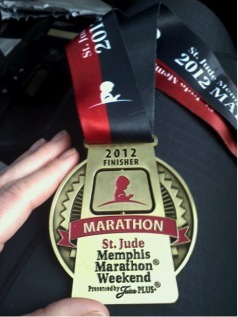 Improving my marathon finish time by nearly an hour is my greatest accomplishment at this point. 5. Do you have any running-related goals for 2013? If so what are you plans for reaching them? 2012 will be a tough year to beat, and I know that. But, I am very optimistic about my ability to continue to improve. One of the most fascinating aspects of marathoning to me, personally, is that it is possible to get faster and better with time and training. I have a long term goal – I visualize this each time I run – that one day I will run in the Boston Marathon. As for this year, I have a few marathons I am considering and I would love to break 4 hours. I think it is reasonable and attainable if I can stay injury free. 6. Since you started running, what is the biggest change in yourself, either physical or emotional that you’ve noticed? The most significant change I am aware of is my self-perception. I used to think of myself as a back of the pack runner. As hard as it was to realize, I had to give myself credit for improving speed and endurance. I needed to select the right starting corral in marathons to keep from being held back – and in 5 and 10K’s I needed to edge my way a little closer to the front before the gun is fired. THAT has been tough for me – seeing myself as a competitive runner. When I look back at my Chicago finish time and (4:17) and compare that to my St. Jude finish time (4:07) – I realized that I positioned myself more accurately in the starting corral in Memphis (St. Jude). In Chicago I was in the back of the 5:30 corral (which slowed my first few miles way down). I learned from this and moved up to the 4:30 corral in Memphis at St. Jude. 7. What motivates you to run? I like the isolation of the training run. I feel free from every care in the world. 8. What kind of music inspires you while running? I am a child of the ‘80s so most of what is on my MP3 player is from that era. There’s a lot of U2, INXS, The Police, etc. The type of music depends on the type of run: for shorter and faster runs, I prefer faster-paced music like rap and hip-hop. I’ll sometimes dig into whatever my teenage son is listening to for help here. My longer runs tend to be mellower; I love to listen to BB King in the dead heat of the Mississippi summer when the humidity hangs in the air like a curtain. 9. What one tip would you share with runners everywhere if you could? Surround yourself with other runners for support and encouragement. People who don’t run won’t understand what you are going through – good or bad! 10. How do you squeeze running time into your schedule? It’s tough. Physically and emotionally running can literally tear you down if you’re not careful. I am very fortunate that my family supports and encourages my endeavors, so sometimes I get away with a few household chores slipping here and there. At the end of any given day, I will have run 10-15 miles and still have to make a trip to the grocery store and attend a girl scouts meeting. When you are runner, it’s part of your day, so you have to figure out how to do IT ALL. 11. What words would you use to describe how you feel while running? When I run I feel very happy and peaceful. There’s a certain clarity that comes to my mind when I am on the road. I get my best ideas, dream up new goals and think about what I am truly grateful for in that moment. 12. How do you fight that “I don’t want to run today” feeling? I have learned to listen to my body. Sometimes the “not want to run feeling” is a sign of fatigue. That may be a call to prop up my feet and read a book instead. MOST of the time I can start putting on my running shoes and I start feeling better about going. 13. How do you power through tough stretches of a run? You absolutely MUST be your own best friend. You must learn to encourage yourself to keep going, push harder and never give up. You also have to learn to not be too hard on yourself too – it’s critical after a training run or race to reflect on THREE positive aspects of the experience before looking for areas of improvement. Otherwise, you’ll burn out. 13.1 Which RockMyRun mixes truly rock your runs? DJ Little Fever’s Brooks RockMyRun Mix is my all-time favorite. I had the opportunity to train with this mix a few times prior to the Chicago Marathon in October 2012. On race day – the mix ended up starting at mile 23. The end of the marathon was by far one of the most intense experiences of my life – hundreds of thousands of spectators lined the streets and as I neared mile 25, I was running like the wind (Marshall Tucker Band)! Perhaps the most interesting thing about this is that I can now listen to the playlist and the music brings back very vivid memories of the end of the race.